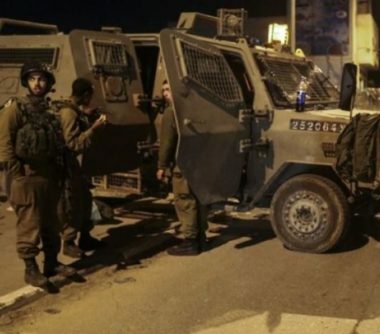 Israeli soldiers abducted, on Thursday evening, a young Palestinian man from his work at a local school, in Tubas governorate, in northeastern West Bank, and imposed a tight siege on a nearby village, on Friday morning. Media sources said many soldiers invaded Khirbat Ibzeeq village, northeast of Tubas, and abducted Mohammad Abu Motawe’. The added that Abu Motawe’ was abducted from his work at a local school in the village. On Friday morning, the soldiers surrounded and isolated Khirbat al-Hadidiya village, southeast of Tubas, to prevent locals and international peace activists from entering the village. Palestinian human rights activist and researcher, Aref Daraghma, said the soldiers closed all roads leading to the village, while many locals and activists were heading there to protest the Thursday demolition of residential structures, sheds and barns. In related news, many Palestinians suffered the effects of teargas inhalation, after several army vehicles invaded Azzoun town, east of the northern West Bank city of Qalqilia, leading to protests. Firefighters also extinguished a fire which erupted in one of the homes after the soldiers fired gas bombs and concussion grenades at them.